This badge provides evidence of a promotional tour that coincided with the launch of the Super Nintendo in the US. Thanks to Andy Cunningham for sending me this picture. I wrote an extensive article on the launch of the Super NES last year. While doing research for this, I scoured magazines and contemporary news articles for as much information as possible. Andy Cunningham sent me this image of a badge used at an event called the "Super Nintendo Entertainment System 1991 U.S. Tour". 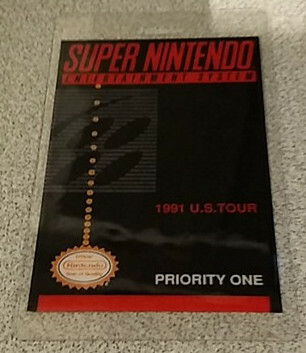 In my research, did not find any reference to this event, but this badge indicates that Nintendo did tour around to promote the release of the SNES. If anyone knows anything about this event, let me know!